y + x = 3.
on page 131 of this manual. We see that the solution of the system of equations is (1, 2). Sometimes we model two situations with linear functions and then want to find the point of intersection of their graphs. 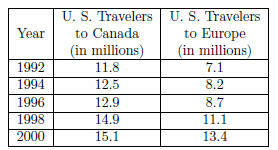 Section 8.1, Example 6 (d), (e) The numbers of U. S. travelers to Canada and to Europe are listed in the following table. Europe, in millions, x years after 1990.
as the number of U. S. travelers to Canada. millions, in c2 and the number of U. S. travelers to Europe, in millions, in c3. screen. We will copy it as y1. See page 137 of this manual for the procedure to follow. We get y1 = 0.45x + 10.74.
be copied to the equation-editor screen as y2. To enter c3 as y, position the blinkingcursor in the y box and press 3.
, use the key to highlight y2(x) and press . We get y2 = 0.775x + 5.05.
y = 0.775x + 5.05. We graph the equations in the same viewing window and then use the Intersection feature to find their point of intersection. Through a trial-and-error process we find that [0, 30, 0, 30], xscl = 2, yscl = 2, provides a good window in which to see this point. will be the same as the number of U. S. travelers to Canada about 17.5 years after 1990, or in 2008. 5y − 2x = 9. −2x + 5y = 9.
the matrix. The arrow keys can be used to move the cursor to any element at any time. the entry line of the home screen by pressing4. We see the command “rref(” on the entry line. see reduced row echelon form of the original matrix. We see that the solution of the system of equations is if Auto or Approximate mode is selected rather than Exact mode). We can evaluate determinants using the “det” operation from the MATRIX MATH menu. as described on pages 151 and 152 of this manual. We will enter it as matrix a. Then press to go to the home screen. Next press 4 to access the Math Matrix menu. Press 2 to copy the “det(” operation to the entry line of the home screen. Then enter the matrix name a by pressing Finally, press to find the value of the determinant of matrix a. The solution set of an inequality in two variables can be graphed on the TI-89. Section 8.9, Example 4 Use a graphing calculator to graph the inequality 8x + 3y > 24.
to see the graph of the inequality in the standard viewing window. lines the fourth. These patterns repeat if more than four functions are graphed. to display the solution sets of each inequality in the system and the region where they overlap in the standard viewing window. of the solution set while x − y = 4, or y = x − 4, is not.